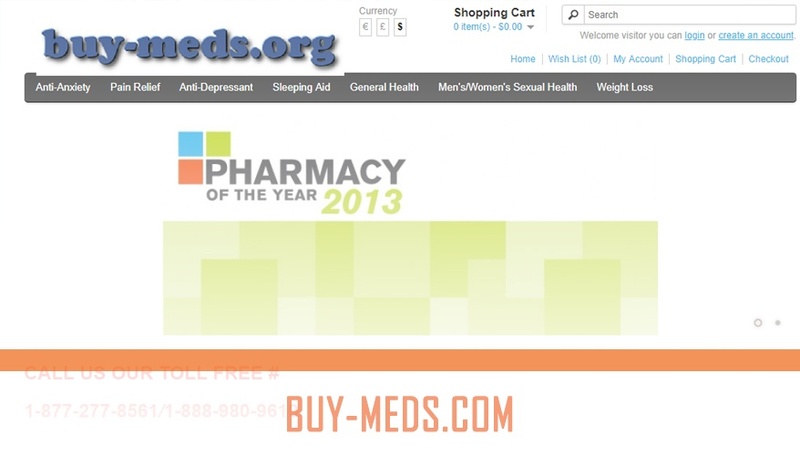 Buy-meds.com Review – Best Pharmacy of the Year for 2013? Buy-meds.com should have looked more inviting since it was named “Buy Meds”. However, the store seemed pretty basic, uninviting, and retro, perhaps because it was created years ago, as its records show that it has existed since 2011. The store though, is now closed – well, it is technically closed but it now redirects to another online pharmacy named Drugspromosite.com. There are no reviews to help me tell you why the shop has closed down or why it’s now redirecting to another platform, especially when Buy Meds claimed to be the “Pharmacy of the Year 2013”. I could not confirm this though since I have no idea which agency gave Buy Meds that title – the store merely posted this title on its site and that’s it. Compared to most online pharmacies, the store Buy Meds offered a narrower product line-up. For instance, it only had medicines for anxiety, sleeping, general health, erectile dysfunction, and a few more others – other online pharmacies were capable of offering a wider product range than Buy Meds. However, unlike most online pharmacies found on the web, Buy Meds stated that all of its medicines were authentic, brand-name drugs, which somewhat throws shade at the generic drug online industry. According to this web pharmacy, all of its products were approved by the FDA since they were sourced from drug wholesalers in the United States or directly from the pharmaceutical companies in the United States. Not only this, Buy Meds has also stated that it employed the service of US-licensed pharmacists so the store was, all in all, legal to ship its products all over the world. There’s no information on Buy Meds stating that it required prescriptions for its products, so the store probably allowed no-Rx purchases on its platform. Given the highly limited information on the web for the Buy Meds website, I was unable to determine more details for this online pharmacy through its records (well, some of the sections of this website were not archived and some sections, like the FAQ, did not actually exist). I was unable to check the shipping fees, payment methods, refund policies, or return conditions implemented by the store. As for communication, Buy Meds offered its numbers 1-877-277-8561 and 1-888-980-9610 to its consumers but it also gave this email address to the buyers: [email protected] Since Buy Meds Org is now closed, these contact details are now inaccessible. I searched for possible Buy Meds shop reviews on the web, but the store did not have any record of customer testimonials or comments for its service. It’s odd how the Buy Meds website failed to have buyer reviews for its service despite the store’s years of existence. The store did not have on-site reviews and the store did not also receive blogger opinions around, those blog posts created by users with no actual experience of purchasing from the store, but ones who were able to use or navigate the store while it was still online. I checked the former Buy Meds website using the web archives and the shop did not have on-site reviews – I would have used the on-site reviews if they were available, even if most on-site testimonials are rather biased towards the shop they are published in. According to the result for the Buy Meds store, the shop is now offline. Scam Adviser detected that the platform was aged 3 years and was from the United Kingdom. Although the trust score posted by Scam Adviser for the Buy Meds store was sufficient, the shop was identified to have malware reports on the web, so the store may have been harmful to buyers in the past. However, since I found no actual buyer complaints about malware, I could not confirm this. Unfortunately, I was unable to find coupon codes or any form of discounts on the Buy Meds former website. Normally, I would have referred to existing buyer reviews for the platform to check if the store was able to offer discounts, but since the store did not have any form of reviews, there’s really no telling if the store was able to offer discounts or ways to help buyers save in the past. The store Buy Meds was a former online pharmacy that has started its service in 2011. 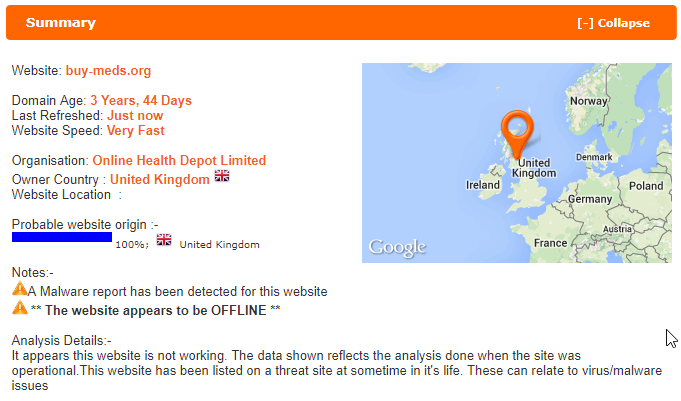 However, like the fate of all the other online drugstores on the web, the store ended up closing down for some reason. Perhaps the store merged with another site since the store now redirects to a new website, but I don’t really know the reason why since there were no reports available for Buy Meds on the web. Because Buy Meds is now closed, I think it’s more appropriate if I’d recommend using other stores, like for instance, the ones included on our list of TOP Web Vendors. These shops are reliable and safe to use and unlike Buy Meds, they’re still open. Chicago-born Rene Anderson is not a pharmacist. He’s also not in the medical industry – in fact, he’s a professor at one of the top schools in his state, teaching marketing. However, he is passionate about people getting access to reliable online information, that’s why, with the help of his 3 friends, he launched rxrumors.com. Rene loves his work-life-social life-hobbies balance and is a serious health nut. Privatepharmacy.net Review – Another Government-Seized Site – But is it Really a Scam Store?